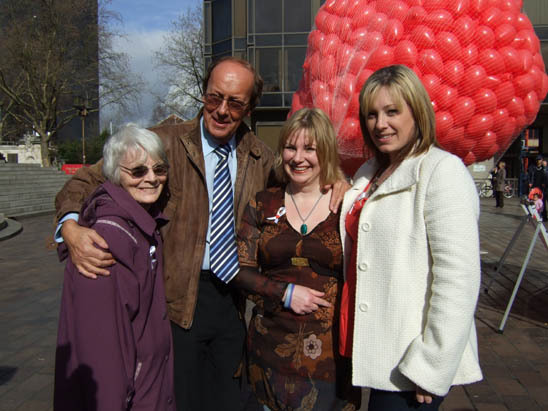 The rising tide of asbestos mobilization throughout the UK was clearly apparent at the numerous events held on February 27, 2008: the 3rd national Action Mesothelioma Day (AMD). Blessed by blue skies and unseasonably warm weather, asbestos victims and their supporters mounted rallies, balloon releases, conferences and public events to highlight the on-going national asbestos epidemic which is claiming more than 3,000 lives every year. Some of the events which took place on that day are showcased in this article. It is remarkable that HASAG, founded less than 2 years ago, has achieved so much in such a short time. That it has is due not only to its founders but also to the serious impact asbestos has had on local people. When Dave Salisbury, a former railway carriage worker, died of the unpronounceable disease: mesothelioma, daughters Diane and Lynne vowed to turn anger into activism; they decided to set up a charity to provide the support for asbestos victims which was so sadly lacking. Unfortunately, the need was so much greater than they had imagined and nowadays. HASAG supports asbestos-injured individuals from Hampshire, Dorset, Sussex and Surrey. 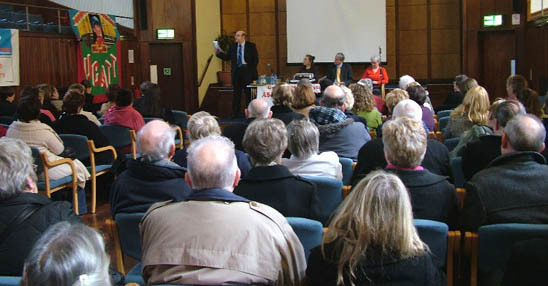 February 27th also provided the opportunity for the first public meeting by the newly independent June Hancock Mesothelioma Research Fund (JHMRF), a group first set up in 1997 to sponsor medical research, raise public awareness, disseminate up-to-date information and lobby for best quality care for all sufferers.2 Leeds Civic Hall was the venue for the JHMRF event which featured speakers Russell Hancock and Kimberley Stubbs, June's son and daughter, local mesothelioma sufferers, medical specialists and occupational health campaigners. Also included on the agenda were presentations by Alice Nutter and Ken Yates, dramatists who have written plays about the impact asbestos has had in the North of England. Director Alan Lane introduced two actors who performed an extract of Yates' play Dust. 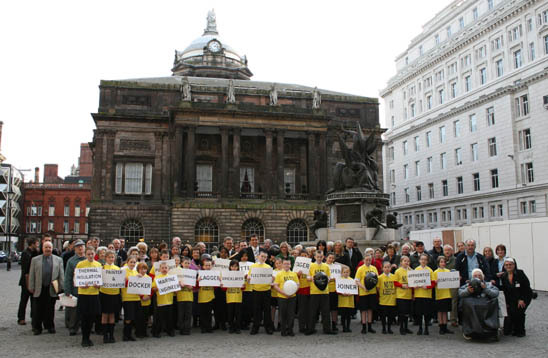 In Liverpool, an event held at the Town Hall was organized by the Merseyside and Cheshire Asbestos Victims' Support Groups which, between them, have helped more than 120 newly diagnosed mesothelioma patients during 2007. Calling for better services for victims, the groups expressed their support for the Health and Safety Executive's new campaign to raise asbestos awareness amongst maintenance and construction workers. Speakers at the lunchtime session in Liverpool included the Deputy Lord Mayor of Liverpool, the Mayors of Wirral and Warrington, the Mayor of Halton District Council as well as medical experts and victim support personnel. Children from the Holy Cross School helped visualize the impact asbestos illness has had in this part of the country. 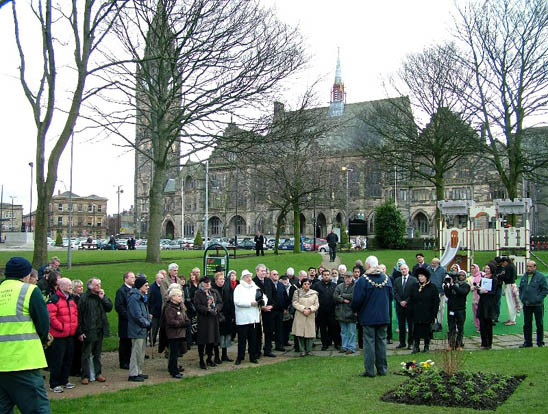 Rochdale has been nicknamed the UK's asbestos ground zero.4 On AMD, the local group, Save Spodden Valley, organized a memorial service at the International Asbestos Memorial in front of Rochdale Town Hall. During the event, tribute was paid to local man Abdul Chowdry, a National Health and Safety Commissioner, who was killed in a traffic accident in Pakistan in 2007. In his memory, a tree and bench have been placed in the Memorial Gardens. As a young man, Mr. Chowdry had worked for the UK asbestos giant: Turner & Newall. 3 Keegan M. Vera's Anti-Asbestos Battle. February 28, 2008. 4 For decades, Rochdale was the location of the global headquarters of the UK's biggest asbestos group: Turner & Newall Ltd. On the 72 acre site in Rochdale, the operations of Turner Brothers Asbestos exposed workers and residents to hazardous asbestos exposures on a daily basis. In 2004, property developers purchased this site and began preparation for the construction of 650 houses and a children's nursery school. Community activists founded the group  Save Spodden Valley  to ensure that the site was properly surveyed and treated.